Optimal indoor climate is determined by humidity. Ideal humidity advised by medical experts lies around 40 to 60% relative humidity in closed rooms. Excessive humidity in apartments and buildings damages building substance, furniture and threatens human as well as animal health. In cellars and archives humidity can also be very high and lead to moisture damage on stored goods. The reason for high humidity in new buildings can often be found in extreme isolation, in older buildings a lack of ventilation and high water consumption represent a problem. Seasons getting warmer and more humid also increase the problem with high humidity indoors. If indoor air is too humid, allergens and mould can lead to respiratory problems and negatively influence quality of life. Avoiding corrosion, condensation, ice and mould, less development of bacteria, reduction of odours, construction drying for existing and new buildings. 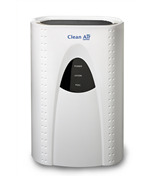 The air dehumidifiers CA-703, 704 and 707 by Clean Air Optima make use of the condensation method. This method is the most efficient because it has the best performance of dehumidifying and the lowest power consumption of all three methods. The Clean Air Optima air dehumidifier CA-703 is equipped with a Peltier element and therefore ideal for smaller rooms and use in a temperature range from 15 – 45°C with a relative humidity above 40%. The dehumidification capacity of the CA-703 amounts 0,25 litres / day (30°C-80%Rv). The Peltier element of the Clean Air Optima dehumidifier CA-703 is an electric component used to move heat from a cold to a warm place. A concatenation of Peltier elements can be used as cooling (or heating) element and humidity will condensate. This works like a heat pump without movable parts or liquids. The Clean Air Optima air dehumidifier CA-703 is hence characterized by easy maintenance! The two Clean Air Optima condensation air dehumidifiers and purifiers CA-704 and CA-707 with compressor are absolutely identical when it comes to design and technology. The CA-704 is ideal for rooms up to 40m²/100m³ and dehumidifying capacity amounts 10 litres/day (30°C- RH 80%): the CA-707 can be used in bigger rooms up to 70m²/175m³ with a dehumidifying capacity of up to 20 litres/day (30°C- RH 80%). The condensation air dehumidifiers and purifiers CA-704 and CA-707 by Clean Air Optima work in an efficient and energy saving way which combines low power consumption with high dehumidifying performance. Condensation air dehumidifiers with compressor technology like the CA-704 and CA-707 by Clean Air Optima are the most frequently used air dehumidifiers on the market and ideal for the heating season in apartments and buildings. During summer months they can be used to prevent mould development in cellars. These both all-rounders in performance with the 2in1 system for air dehumidification and air purification can be used within a large range of temperatures +5 tot + 35 ° C.
Thanks to the 2in1 function for air dehumidification and air purification, the CA-704 and CA-707 provide optimal indoor climate throughout the year: when the programmed relative air humidity is reached, dehumidification stops but air purification continues. The continuously working air purifying function of the CA-704 and CA-707 by Clean Air Optima liberate indoor air from allergens, mould, animal hair, pollen, dust and smells all year long. 3. UV lamp. The ultraviolet light of the permanent lamp (UV-C radiation) with a wave length of 254nm eliminates unhealthy microorganisms such as germs, viruses, mould (spores) and bacteria. 4. Ionizer capacity > 3.000.000 negative ions / cm³ which are spread throughout the entire room and thereby neutralise harmful particles and odours. 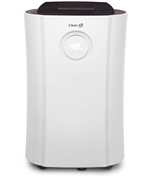 The Clean Air Optima air dehumidifier CA-704 with the 2in1 system for air dehumidification and air purification gives support for drying your wash. The swing function of the oscillation valve with a wide angle between 45° - 90° ensures good air circulation in the laundry room. In comparison to a normal tumble dryer, this method is saving much more energy and protects the environment. The prefilter catches the bigger dust particles in the laundry room and the active carbon filter neutralizes smells. The negative ions produced by the ionizer during laundry drying have an antistatic effect which positively influences the drying process of your wash. The compact and very powerful Clean Air Optima condensation air dehumidifiers & purifiers drain superfluous humidity from indoor places, actively prevent development of mould, stains, corrosion and bad smells. They improve indoor air quality. This protects the building materials and, even more important, your health! If relative air humidity lies below 50% iron and steel surfaces do not rust. Condensation does not appear on surfaces if the air in contact with the surfaces has a dew point below the temperature of the surfaces. No ice appears on surfaces if the air in contact with these surfaces has a dew point below the temperature of the surface. Bacteria also need humidity to develop. Often the humidity bacteria need can be found on hygroscopic material. When relative humidity is kept below 50%, the bacteria cannot reproduce themselves. Mould needs humidity to develop. If air humidity is reduced through dehumidification, the most important reason for mould development is eliminated. Bad smells are drastically reduced when relative humidity is kept below 50%. Generally odour-forming substances adhere to vapour. The less water molecules in indoor air, the less “odour molecules” can reach our respiratory tract. Dehumidification by condensation dehumidifiers with a compressor, such as the CA-704 and CA-707 models from Clean Air Optima, is the most efficient way to remove moisture from buildings, new buildings or buildings with water damage. By dehumidification through heating, humidity is only displaced from one room to the other and heating in combination with outdoor air leads to high energy costs.